The Women’s Poetry Festival 2018, organised by PEN Malawi, was hosted in Blantyre from March 19-21, 2018. The festival was preceded by a workshop and followed by poetry performances. This blog was generated from a report by PEN Malawi President Alfred Msadala. We thank you for giving us access to the report Mr President. Blantyre, Malawi was abuzz with activity as the city hosted a series of events in the celebration of the poetry art form as a literary conference, a workshop and a night of enjoyment went down on World Poetry Day on March 21. There was a focus on the women poets as there was a need to do an intervention in the country. The Poetry Workshop March 14-16, 2018. 11 women participants attended the workshop from March 14-16, 2018 at Jacaranda Cultural Centre. The names of the participants were Luckier Chikopa, Esnart Tambala, Violet Banda, Agatha Malunda, Nancy Phiri, Rhoda Zulu, Xara Hlupekire, Grace Sharra, Matilda Phiri, Linly Maenda and Patricia Khonje. The facilitators were Prof Gayle Brandeis, Prof Mildred Barya, TJ Dema and Jumoke Sanwo. Of the forty four poets represented, only six, including one expatriate, are women. Considering that the present editor is male, one would be tempted to think that he has (naturally) favoured his own gender. However, that is not the case. If anything, he has gone out of his way to find women poets to include, sometimes bending his terms of reference. That there are few women represented can be explained by the Malawian lady’s general reluctance to participate in matters of a literary nature. Whereas the traditional woman was at the centre of society’s cultural life, playing leading roles in such activities as storytelling and song composition, her literate modern counterpart tends to shy away from writing as an art. Many of those taking part in the workshop were beginners and the workshop gave them skills that helped them launch their writing career on a better understanding of the craft. Those who were already published poets discovered where they could improve and even become a more confident poet. The books that were supplied by Brown Turtle Press in the USA, The Practice of Poetry edited by Robin Behn & Chase Twichell; A Poetry Handbook by Mary Oliver; and The Poet’s Companion by Kim Addonozio & Dorianne Laux proved to be the right workbooks for the course. The exercises therein were practiced to the perfection of the art with the individual participants. This is the task that is at hand. Those women who are published must be encouraged and nurtured as well. But above all, let them attain heights. For those that are still shy, let them be brought out of the cocoon. 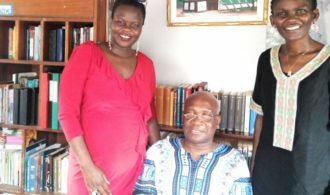 Rread more about the award given to legendary Malawian poet and academic David Rubadiri. The conference was facilitated by Beverly Nambozo founder of the Babishai Poetry Prize and Festival with the assistance of Susan Kiguli at Jacaranda Cultural Centre. Both of these are from Kampala, Uganda. The main focus was on the confidence an African woman in order to achieve in what is known as a man’s world. Nambozo herself is a case in point; she is a world class speaker and has been invited to many parts in the world to address audiences, especially women. She pointed that it is for Africans to raise their own flags; meaning that let Africans identify themselves out of the world. This was the climax moderated by Patricia Khonje. Women were joined by their male counterparts in reading and reciting. The fun was complimented by the art of storytelling by, in full traditional regalia, Nancy Phiri. The main artists were the conference participants and the guest artists, Beverly Nambozo and Susan Kiguli. Amongst the men who participated include Kingston Lapukeni, Jonathan Mbuna, Egidio Mpanga and Felix Njonjonjo Katsoka. In Malawi, there are a lot of poetry recital events and some of them are done on a commercial basis. But this was a unique event, taking place on the UNESCO day and drawing the public at large. The show even went into an extra one hour and the hosts had to bear with us. Poetry reaffirms our common humanity by revealing to us that individuals, everywhere in the world, share the same questions and feelings. Poetry is the mainstay of oral tradition and, over centuries, can communicate the innermost values of diverse centuries. There were testimonies, especially from the ladies, about this. Most could demonstrate that they had been living in denial.